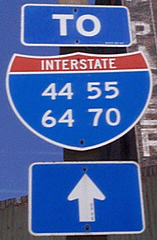 Interstate 44 is an Interstate Highway in the United States. It goes from Wichita Falls, Texas northeast to St. Louis, Missouri. The route is 633.79 miles (1,019.99 km) long. Interstate 44 Facts for Kids. Kiddle Encyclopedia.